An "extraordinary" connection has been uncovered between a fountain in India and one taken down in the UK over 50 years ago. Northampton's Market Square fountain was erected in 1863 to commemorate a royal marriage. But the 45ft-high ornate structure was dismantled in 1962 after it was targeted by vandals. Now it has been discovered that its "twin" was erected in 1867 in Mumbai - more than 4,000 miles away. That one, called the Fitzgerald Fountain, was built in honour of a British governor of Mumbai (when it was known as Bombay). It was moved from its original location, at the Metro cinema junction, to the grounds of the Dr Bhau Daji Lad Museum, and was left neglected. Recently, a team of engineers started its restoration, but could not find enough information on its design. They contacted industrial archaeologist Peter Perkins, who had been researching the former Eagle Foundry in Northampton, and he was able to join the dots which confirmed both the Northampton and Mumbai fountains were forged there. Mr Perkins' research put him in touch with BBC Radio Northampton presenter Jona Kotnis, who used to pass the Indian fountain on her way to school in Mumbai. She described it as "magnificent" and "impossible to miss". 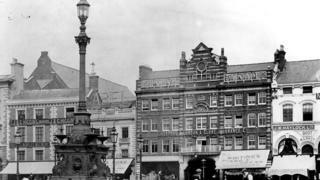 Her husband Arun became a town planner and in 1987 looked to rebuild the Northampton fountain. He showed her some drawings of it and she had noticed the similarities. When Mr Perkins got in touch they were able to suggest he should contact the Mumbai museum. The Indian restoration team has confirmed that their fountain has the same patent design number as the Northampton one, which Mr Perkins said was "extraordinary". Mr Perkins is now sharing information with the restoration team in Mumbai, who hope to put the fountain back in its original location later this year. But Mr Kotnis' dream to recreate the Northampton fountain remains unfulfilled. A new fountain was built in 2010 in the Market Square, and refurbished in 2014 but has left locals underwhelmed. The cast iron plaque from the 1863 fountain is all that remains, and is in the Abington Park Museum in the town. Mr Kotnis said that if the original could be restored he "would be a very happy man".